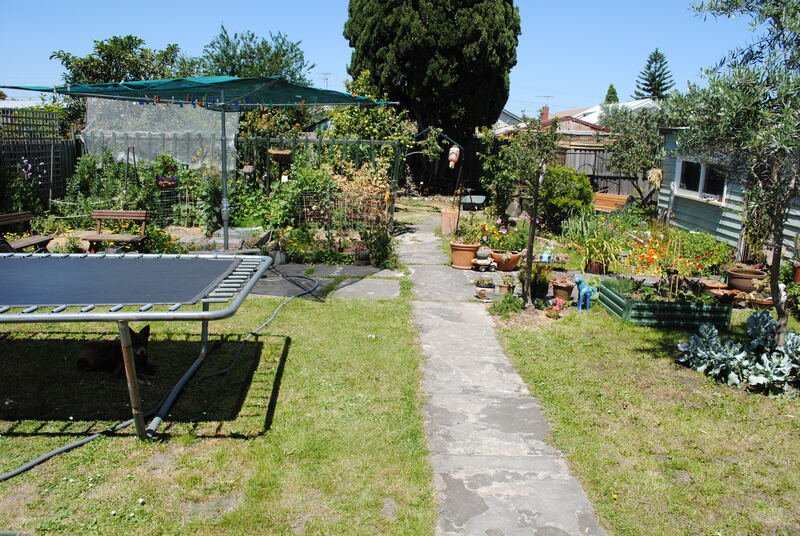 Years ago, in the days when stuff arrived in the mail, printed on paper, I came across a very funny article in Sustainable Gardening Australia‘s newsletter, which questioned the logic of suburban Australia’s love affair with ‘the lawn’. Here we were, smack bang in the middle of the longest drought in my generation’s memory, and people were still watering, mowing and feeding their grass. And what is grass good for? Absolutely nothing. Well, I have to temper the above statement with an acknowledgement that grass is good for cricket ovals and for feeding ruminants, but that’s about it. There’s still an absurd preoccupation with lawns, right across Australia, even though we now know that keeping them alive is pretty damn difficult in an age of dwindling water. Wasting a whole lot of energy and water on something that is purely aesthetic also seems more than slightly selfish, given our farmers and food producers struggle to access the water they need for livestock and agriculture. 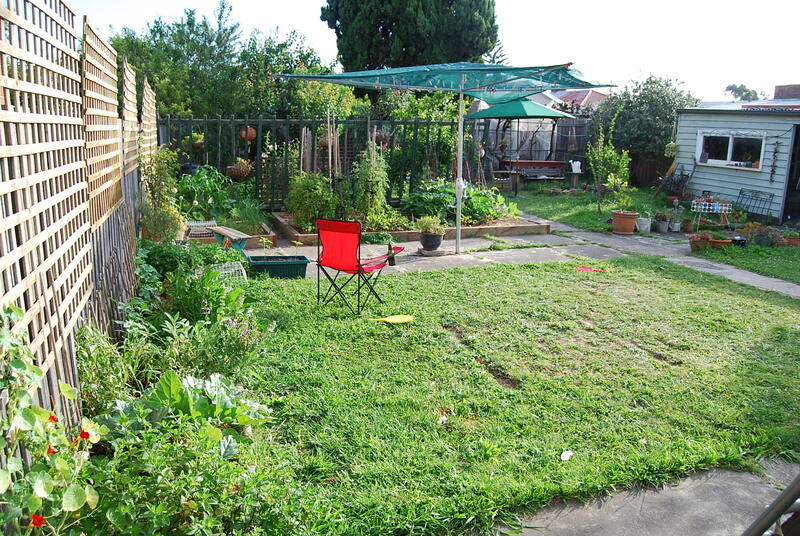 If I owned this house there would be only one patch of grass remaining, the one under the trampoline (see below from summer 2012 – that’s the bit where the tramp lives). 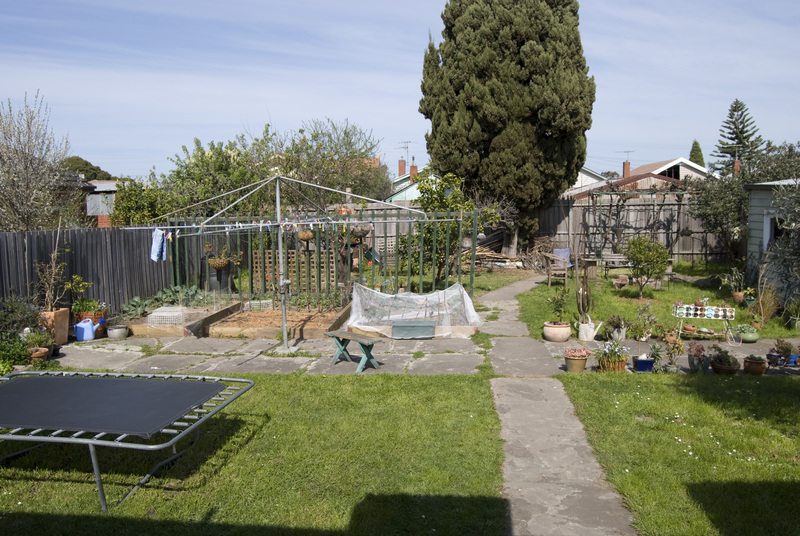 As a renter, ‘though, I’ve had to accept that eradicating all the grass from the front and back yard (the block is an estimated 800sqm) is just way too big a job, particularly as we might find we have to move at any time. But, since moving in two and a half years ago, a steady war has been waged on the grass in the back yard, slowly increasing the productive growing space and reducing the amount of mowing required. The above photo shows the orchard in early spring of 2011, with lots of grass. By this time, I’ve liberated the fruit trees from their concrete traps and started to build wider beds around them. Now, these beds are home to a variety of great bee-attracting companion plants, such as borage and calendula, ensuring we are getting a good crop of fruit each year. A couple of weeks ago, as we contemplated mowing yet again, we launched our most concerted attack on grass in the orchard to date (see above). 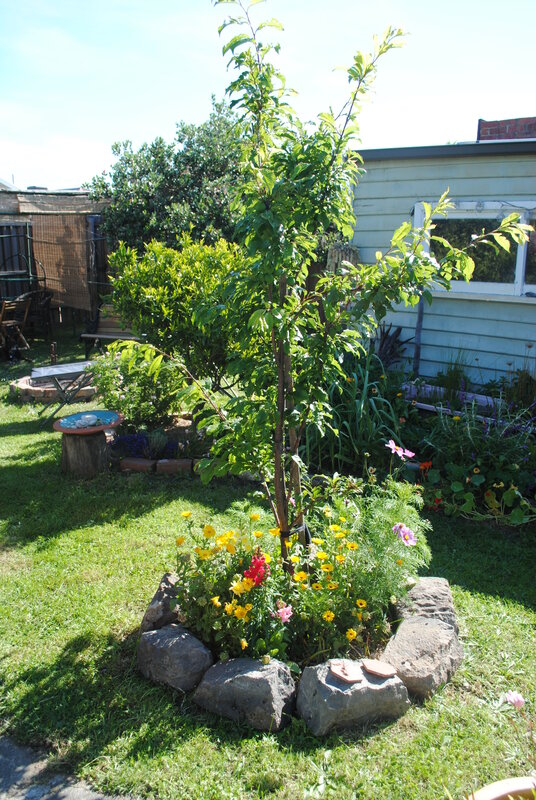 We merged the beds under the apricot, plum and orange trees, creating one giant bed that takes up at least a third of the space, filling it with compost and manure. We also created a bed under the lemon tree, further encroaching on the grassy bits. 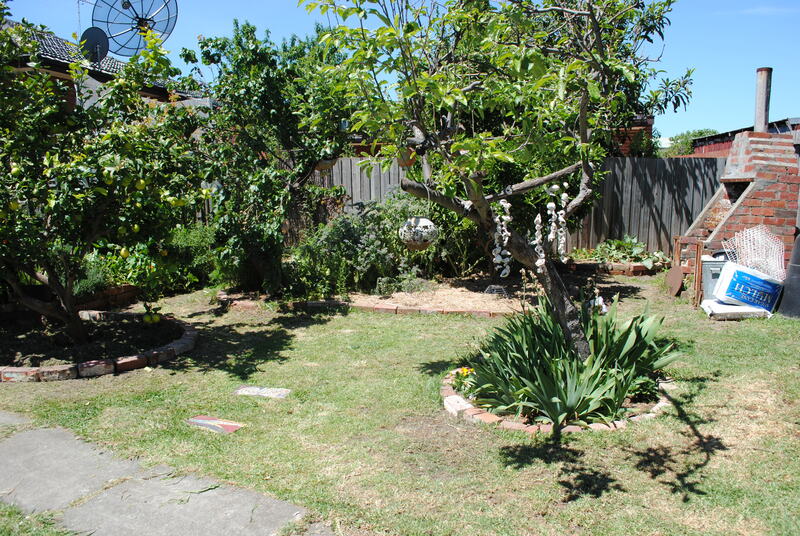 And if there’s one good use for grass, it’s as clippings to kill off other grass, so we filled the area under the lemon tree with mounds of clippings. Eventually I’ll cover this over with compost, etc, creating yet more planting space. The paths between the beds have been all but shaved of grass and are going to be covered with woodchip mulch, leaving only one small grassy knoll left to mow. A couple of months ago, I wrote about creating my pond, and extending the garden bed around it in Pond Life. This whole section of the garden is slowly succumbing to my grass depletion strategies, and I’m thinking all of it may well disappear in time. 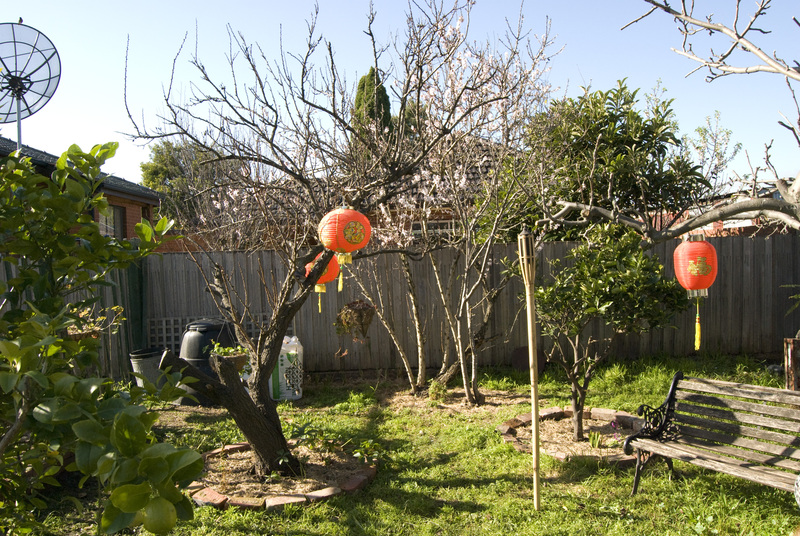 The photos above show the Satsuma plum (which we planted two years ago) in late winter this year and now, photographed just yesterday. We’ve used the bluestone left over from the great orchard garden bed merger around the plum, and it looks stunning against the colours of the cosmos, snapdragon and calendula companions (there are about 50 plums on the tree, in part thanks to these flowers and their bee visitors). You can also see the growth that’s taken place around the pond in the background, which is featured in the banner image at the top of this post. Another place where the war on grass is occurring is in the area around the olive tree. We moved my old apple tree to the corner, digging out a bed beneath it, which is to be expanded over time. Since then we’ve added a raised garden bed as well, the construction of which can be viewed via The Dirt. 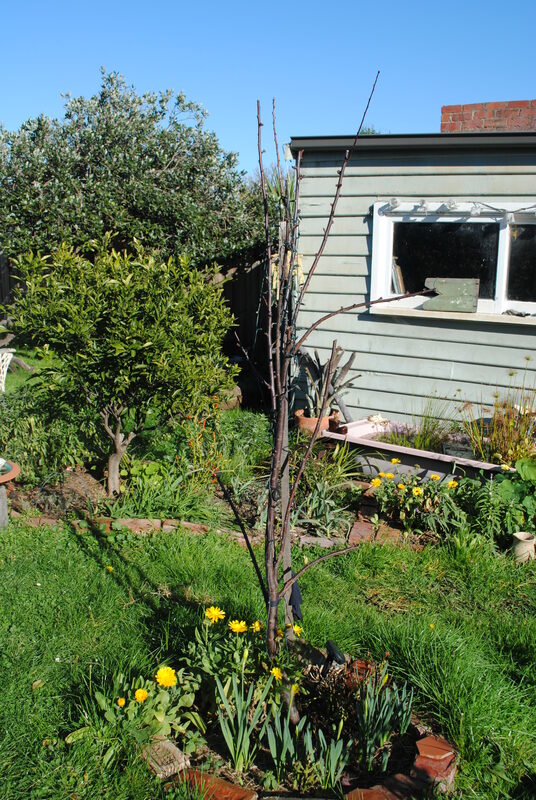 And here’s the apple tree from yesterday, with the new garden bed behind it, both getting their growth on in a matter of a month and a bit. Underneath the apple tree (which originally came from my aunt’s garden and has now been moved four times), I’ve planted a low-growing rosemary, geraniums and salvia, and catnip for the kitten, all of which are great companions for fruit trees and vegetables. The new bed holds dill, silverbeet, lettuce, cucumbers and a Tommy Toe tomato, and we’re eating stuff from it already. Now the great grass war has begin in earnest, I doubt it will end any time soon. Just jumping in and getting rid of as much of the stuff as possible has proved to be relatively easy, and extremely satisfying. Not only will less grass save us time, but I’ve increased our space for growing food, which also means there will be more to share around. 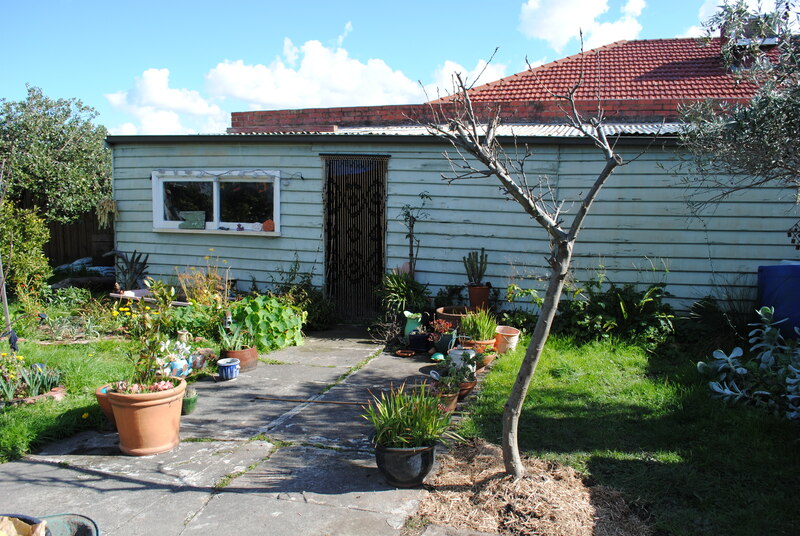 The first photo below shows the garden from the back door about two years ago, and the view as of today. 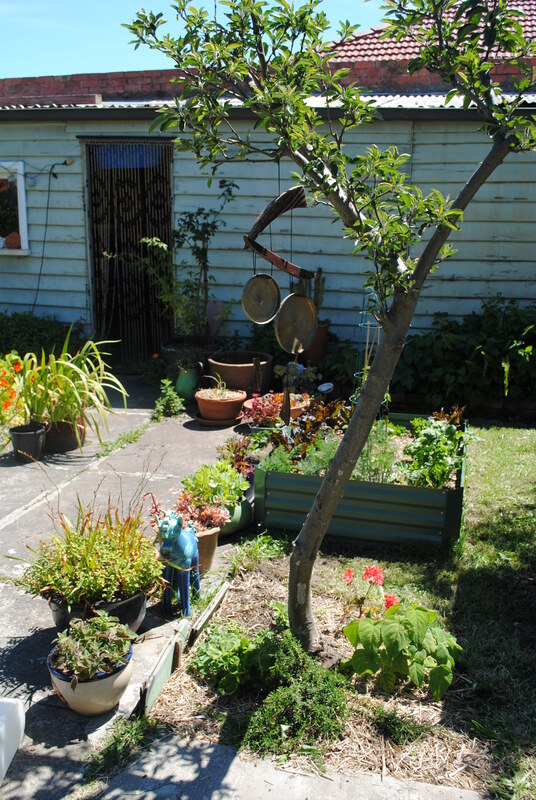 More than anything this illustrates how quickly a garden can be brought to life, using basic permaculture principles and with a bit of hard work and vision. Hessian is great for spreading over grass and eventually killing it off. You can pile manure and compost straight on top, and plant within days. I collect hessian sacks (for free) from the local greengrocer or from the market, and then cut them open. The best thing about this method is that the hessian decomposes over time, leaving you with a deeper bed, and no grass. 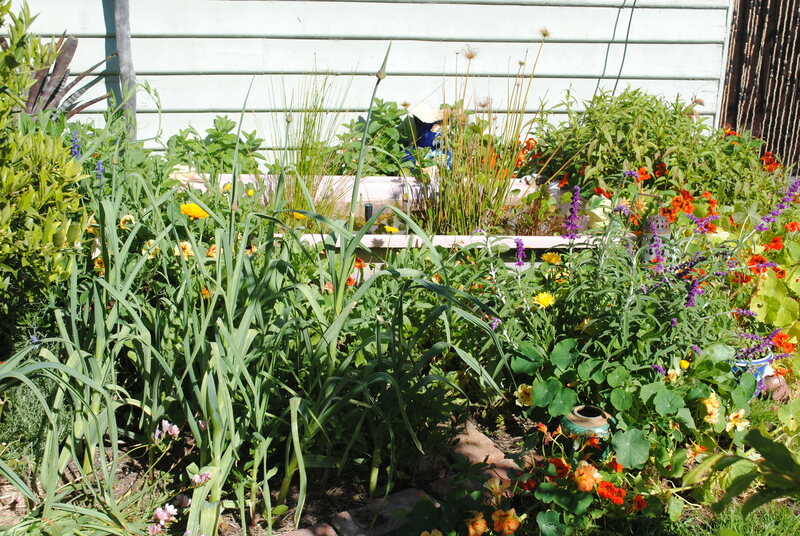 Growing things like calendula, borage, parsley, mint, pumpkins and nasturtiums, which all self-sow or spread like crazy, is another good way to overwhelm your grass with nicer things. Eventually the grass gives up and goes away. As mentioned above, if you do have grass, use the clippings in thick mounds to kill off the grass under fruit trees or elsewhere. Grass clippings are a great source of nitrogen for the trees, and should also be added to compost for the same reason. We don’t really want to waste water on a lawn, but it keeps the house cool. Living in the Flindtes Ranges it’s important tome, emotionally to feel cool in summer. Would love an idea to replace it, native ground cover?? Something else?? Any suggestions?? Well, it depends on the environment the grass is growing in. I agree, a patch of grass is nice to lie on in summer, in the shade, so I was being pretty hardline in my post. Funny though, I began to think about Melbourne’s parks, and how the grassy areas have had to be reduced over the years, to mulch the old elms and other European trees, to keep them alive. And of course, grass doesn’t grow all that well under eucalypts. That said, there are some ground covers you could try, if the area is relatively shady (or at least shady during the hottest part of the day). Corsican Mint and Roman Chamomile (a great bee attractor) are a couple of ground covers that come to mind, but I’m sure there must be some Indigenous ground covers that could at least be intermingled with grass. Try http://www.australianplantssa.asn.au/australian-plants/articles.html.